We are innovators propelling new heights and breaking traditional barriers. We provide intuitive and practical solutions to meet the specific business needs of our customers. We offer a sophisticated cash flow forecast and measurement solution driven by working capital quantifiers. Our solution focuses on key performance drivers: forecast of receivables, payables, and inventory time measures which then translate/quantify to actual performance. Trouble-free extraction of data from an existing ERP system compare actual performance results against cash flow forecast. We offer a range of progressive financial reporting and budgeting, planning, forecasting and financial analysis solutions. These are designed to help management teams grip business drivers, take steps to boost performance, driving costs and inefficiencies out of the business. 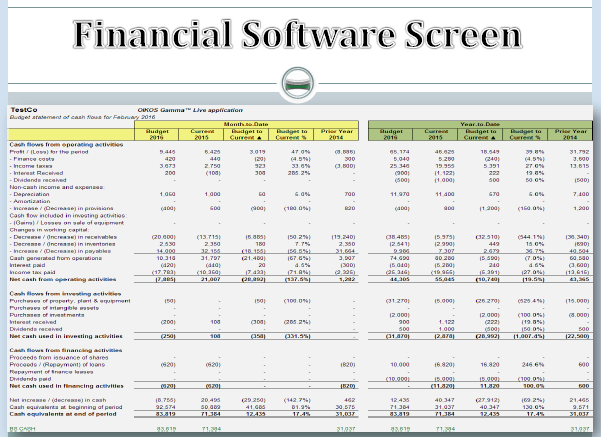 We offer a quality financial reporting package. This is particularly critical to small businesses and/or divisional/subsidiary reporting within large organizations. Our solution provides for insert and edit of all management discussion notes allowing flexibility to utilize default built or custom notations that accompany financial statements.